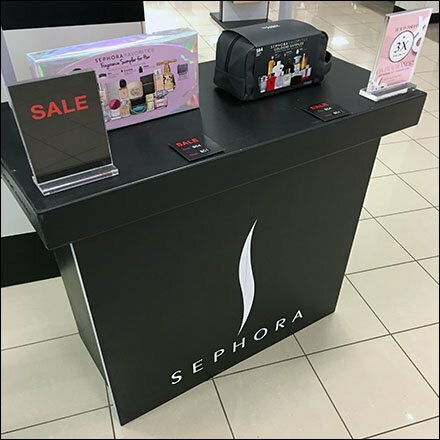 A freestanding corrugated Sephora Storefront Power Aisle Display in branded black and white livery takes special sale items direct to the people. Though large, this counter-like display is more in scale with passersby, and more in-your-face than the purely branded storefront itself. Much smaller, 5 sale splats, signs and table-top Talkers let you know these Sephora items can be had a attractive prices. And the Sephora logotype and logograph are a prominent part of the outreach. Though corrugated in construction, this display could not look more like an actual counter furnishing. Pretty good looking Sephora. Consider in the Sephora Storefront Power Aisle Display gallery of images. Seen at Sephora inside JCJenney.